The No. 4-ranked Panthers get two second half goals to oust the upstart Spartans. The Hillsboro Spartans boys soccer team traveled to Independence for a first round state playoff game, stood tall against the state's No. 4-ranked team, then ultimately fell at the hands of Central, 2-1, Oct. 30, at Central High School. 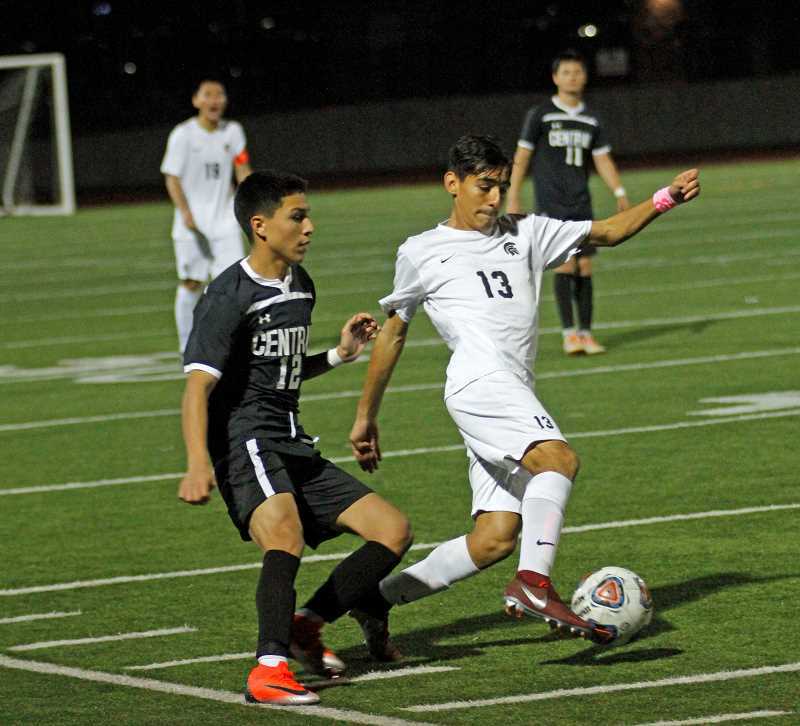 Hilhi took a 1-0 lead early in the second half, then watched as the speedy and potent Panthers tied the score, then netted the game winner when senior forward Brandon Lopez scored from inside the 18-yard box in the game's 76th minute. "I thought we went head to head with them," said Hillsboro head coach Stuart Hoiem. "Going on the road against a good opponent with a young team is always going to be tough, but I think the guys were hungry, they collected themselves, and when we started warmups you could feel the buzz and they were ready for this game. It just didn't workout." Despite their mindset, and a lead early in the second half, the Spartans never truly felt in control, as the explosive Panthers continually battered Hillsboro's back line, threatening the net for much of the game before breaking through in the 46th minute, which seemed to put the Sparts on their heels while rejuvenating a Central team shocked by Hilhi's opening goal. "We held them for a little while, but we started to breakdown a bit in the midfield and they put us under that pressure with those guys up top, and ultimately they got that second goal," Hoiem said. After a scoreless first half that was played primarily in the midfield as the two teams felt each other out, the Spartans took control of the game — or at least the scoreboard — in the 42nd minute when following a quality build-up, Hillsboro's Jair Diaz Sanchez took an entry pass and blasted a left footed shot from roughly 15 yards into the back of the Central net, giving the visitors a 1-0 lead. The goal, which invigorated Hilhi, seemed to wake the fourth-ranked Panthers from a daze and ratchet up their intensity. 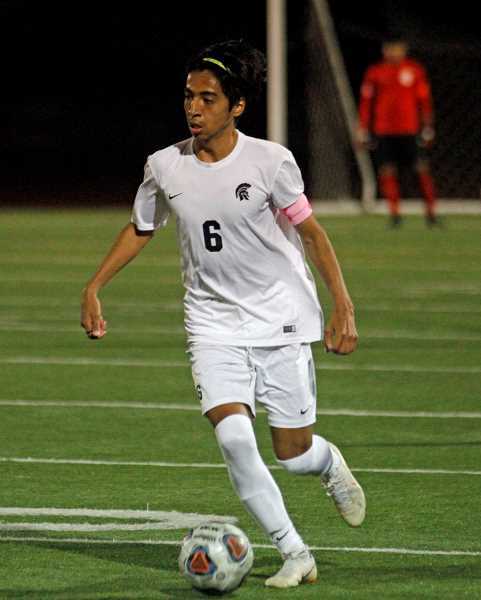 Four minutes after the Spartans' goal, Central's Omar Ceja broke from the pack and narrowly scored when the sophomore forward's initial shot was defelected by a diving Pablo Mendoza Osornia, but he then calmly gathered the deflection and put the ball in the back of the Hillsboro net, tying the game 1-1. With their newfound confidence and the home crowd cheering their every move, the Panthers repeatedly penetrated the Spartans defense via the dribble and/or volleys off of second balls, finally sealing Hillsboro's fate with Lopez' game-winner with just four minutes left on the clock. "One thing we've struggled with all season long is playing the ball out of the air when we're under pressure," said Hoiem. "Teams come in and start banging away on us and start wearing us down, and we start taking ourselves out mentally and we start hesitating to go after the ball. "We're not thinking about second and third opportunities. And they start picking balls up, and they did a lot of picking second balls up and getting the balls to their speedy guys and going at us one-on-one." Now, with the season over, Hoiem — albeit with little time — fondly reflected on the year and was proud of his team and what they accomplished with a very young and relatively inexperienced team. "I feel good about next year," said the coach. "We don't have that true goal scorer, one that puts himself in the right spot or works to create it, so we need to get more support for the guys up front and need to try and get the ball in better spots. But Overall, I was proud of how we performed and I think we gained some valuable experience that can hopefully help us next year."